There is a trend in public management to hire people in top level positions who are purely technocratic functionaries — or worse: they know how to feed the egos of elected officials and not much else. These so-called public managers are weak as leaders. They do what they’re told without contributing to the conversation about how best to perform in the public interest. Good public managers must be transformative leaders (Burns), who are critical systems-thinkers; good collaborators; and effective co-creators of desired futures (Senge). They also must know how to build the three main foundations for political quality: the rule of law; strong and properly resourced organizations; and a culture of democratic transparency and accountability (Fukuyama). Public managers must be guardians of the public trust who know how to help build a Good Society. 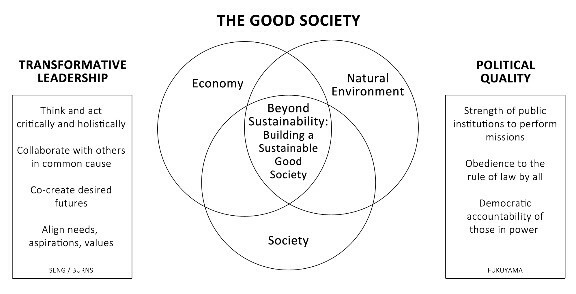 Sustainability — which stresses justice across the interdependent domains of the economy, society and the natural environmental — should become an organizing principle and overarching visionary goal of the organizations public managers lead. Where are the transformational leaders and builders of political quality among appointed public managers and elected political leaders? What’s behind this decay in the leadership capacity and political quality? What’s keeping a new public administration paradigm from arising? I think the best answer to these questions is “identity politics.” Elected officials want safe bet appointments who “think like us.” If someone is perceived as having a counter—world view or an innovative idea contrary to dogma—ideologues move to blacklist or fire them. We need a renewed respect for public servants who answer a vocational calling. The best mangers know how to remain objective, to point out the pros and cons of various courses of action. They have a sense of the moral high ground and the common good. They have the autonomy to do their job as independent thinkers and actors, accountable to trusting elected leaders. Instead, public managers are everywhere under assault by ideologues who have a political agenda to deconstruct public agencies and disparage employees. Our culture must stop denigrating our public administrators, cease the obsession with privatizing public services and abandon the ridiculous assumption that government should be led and staffed with people because they have business experience. Many people who are appointed to significant positions in public administration because they have a business background prove out to be incompetent. They have no understanding of the principles of good government, no sense of the context in which governing must occur. Far too many public managers come from the special interest groups agencies are designed to regulate. This is an old form of corruption of governments the world over. How to understand this tragedy and transcend it is among the most significant challenges of our time. Identity politics causes us to see the “other,” the one who is different, as an enemy to be defeated, rather than a person capable of helping lead with proficiency. Good leaders are creative and imaginative people. Many of them are different, a cut above the ordinary. That’s what makes them good leaders. Weak public managers often rely on arcane management practices, are terrible leaders and have no knowledge of modern organization theory or practice. Many people in the public service have developed a siege mentality due to bad leadership and ideological tribal politics. All they want to do is to keep a low profile, keep earning their paychecks and make it to retirement. Others are more restless, and want to make a difference. Unless public managers become mediators of the tensions between elites and ordinary people, builders of political legitimacy and confidence-builders of good governance, the Progressive Era designs for improving governance may end up in the dustbin of history among the hollowed-out institutions unable to adapt to the demands of change. This loss includes the federal, state and municipal public administration principles and practices at the core of modern theory and practice; including the council-manager plan. There is another aspect of this tragedy of public management. Promising talent will decide to avoid a public career. People capable of providing transformative leadership will leave the public service. Capable public managers are often boxed in, demoted, or fired. These servant leaders are wounded warriors with broken hearts. They must become our most respected leaders — or our economy, quality of life and natural environment are doomed. Hopefully, their tragedy in the moment will help shape an even stronger character, whose servant-leadership will become irresistible. But first we must awaken to the tragedy of public management, see its connection to the larger dysfunction of our political system and rededicate ourselves to building a worthy public service. In my work, I call for a grassroots Cosmopolitan Uprising — a renewal of the principles and values of democracy, what I label Civitas, before it’s too late to renew a sustainable political system and a good society. Author: Larry Arrington is a Florida-based former city and county manager, and planning and management consultant. He is President of the Civitas Project, a non-profit organization affiliated with Stetson University and dedicated to good government. To explore Larry’s blogs and books, go here. Howard, I agree with your views about public management, especially your comments about arcane leadership practices. Governments ought to be recognzing people who demonstrate understanding of new approaches, and a good grasp of organization theory and leadership studies. Some government do this, of course, but far too many don’t. Thanks for your comments. As background I consult frequently with government and post occasionally on this website but my training and most of my career has been in the private sector. Today government is at a crossroad — there is a need for leadership to move away from old, old management thinking but few leaders with the experience to be a catalyst. I argued recently that government would benefit from recognizing and promoting those public employers that are leading the way in adopting better management practices. Larry–Well said. Since Gabler and Reinventing Government we’ve seem to have gravitated to the whole notion of process and private sector effciency as the know all end all approach to governance. It misses the whole point behind a knowledge of civics and our responsibility as citizens and as bureaucrats. In this instance, citizen engagement becomes nothing more than a process; at times self-serving. The dominant conversation among our professional associations seem to substantiate an over reliance on methods rather than addressing the democratic/representative needs of the populance. This is tough work. Process and methods are easy to explain. Follow the manual. What I think you are discussing is much harder and very risky to those that subscribe to your scholarship. Excellent Piece!!! I agree that there are risks for public managers in learning and seeking to practice the great democratic principles and values of moral and political tradition, what I label “Civitas.” But our estrangement from this body of wisdom is precisely what is causing so much of the present disorder, dysfunction, and decay of our political system. Public managers don’t have to be experts in political theory, but it certainly helps for leaders, especially those who are advising elected officials, to have a sense of first principles, and of history. And, it never hurts to cultivate Tocqueville’s habits of the heart, and to try to practice the Golden Rule. Process has overtaken substance. Ideology triumphs over common sense. Civitas teaches how to transcend the former, and embrace the latter. Well said. Somehow the value of civitas needs to be equally prioritized with the notions of performance and process. Thank you for the very informative piece. Good governance begins with a simple characteristic – mutual acceptance of facts. The single greatest tragedy of our current governance environment is the absence and refuting of facts. A part of the rising up you mentioned in the piece is the need for each of us to decide that we will not participate in the destructive practice of accepting low-level information consumption, and that we will better vet talking points before embracing them. I know that this is a tall order for many of us. Please recall that the very thing which started this trend in our politics and governance is the acceptance of falsehoods – a practice which many of our fellow Americans have been unable to recognize in the first place. And every day now, we are asked to accept more and more abnormal, untrue, unverified absolute statements that contradict truth as being fact. Those are my 2 cents on why we have this failure in leadership in governance and public administration today. I agree that the art of deception has triumphed over truth, especially in our political system. I write about this in my books and blogs, trying to understand why ours has become a culture of lies. Please go to my website, TheCivitasProject.org, and find a blog titled “Oh, What a Tangled Web We Weave…” I wrote it last April, but its general content remains relevant. I argue that much the problem is traced to the victory of the principles and practices of unfettered free market capitalism over those of democracy. We have become a nation of consumers, rather than of citizens who place high value on the collective search for truth. I’m glad Mr. Arrington is thinking about this. Here’s what’s fundamentally wrong with private enterprises taking over public services. Private enterprises seek profits or else they will fell. Pure and simple – that’s the mindset of the owner(s). That’s the objective of the owner(s). Once they get into the public sector, they try to bring that mentality with them. First thing, cut employees and some services to make the bottom line. Forget about employee rights, civil service laws, and other ethics policies that protect workers. Just slash and burn; change the laws, etc. Well, eventually, they hit a brick wall, due to the loss of experience and institutional knowledge that comes out of the slashed workforce. And so, they end up at a stopping point with the slashing, which now they have the diminished workforce but the same workload or backlog of work. So they begin to either outsource the work (which is costly, and not always results in quality output) or hire new employees with less benefits. Eventually, these private people leave, especially, when there’s an administration change. You’re left with an upended workforce, with inexperienced people and backlogs of work for them to contend with. Bottom line, leave public service to public servants; to people who have dedicated their lives to their work. These people generally don’t make a lot of money, but they sure don’t mind serving others. I agree with your comments about privatization, which can work in some circumstances, but the costs usually outweigh the benefits. There are some public services that are ill-suited to privatization, especially those that involve public safety and exercise of police powers. Privatization also feeds the perception that business always out-performs the public sector, but that’s a bogus argument, as my PA Times article suggests. I think there are ways that a blended intersectoral approach can work well; one that carefully privatizes public services within a framework of democratic accountability and true partnership. And, let’s not forget the non-profit sector, which sometimes carries the benefits of innovation and fidelity to the common good. Thank you, Larry. I’ll take and respect every compliment I can get!!! This is an excellent, honest piece. I would underline one central point: The need for public managers of the sort called for here to find the balance between their own fierce commitment to their own independent thinking and to their understanding of the public good, with acceptance of the norms of electoral democracy. A hard but essential combination. It is a hard, but essential combination to blend independent thinking and accountability, human nature being what it is. We all need to be checked and balanced. I worked for a master of finding the right balance, the late Dr. Thomas C. Kelly, who served as County Manager of Volusia County, Florida for many years. I had the honor of following Tom in that position. He carried a PhD in political theory from Georgetown and knew a thing or two how our political system ought to work. But he always respected the process. He believed that if the time came when a manager couldn’t agree with the policy direction of the board, it was time to move on. But most of the time a little humility works best.